unless you live on another planet. You are aware that the fortunes of this franchise instantly changed when The Oilers won the rights to select, Connor McDavid. There has been complete turnover in the management of the organization. New GM. New coach. New president. New scouts ect. All necessary moves in my opinion. The Edmonton Oilers possessed a lot of picks heading into the deep 2015 NHL Draft. it was obvious to everybody who was going to be first overall. 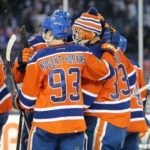 McDavid is the best NHL prospect in the last decade at least. Connor McDavid is a once-in-a-generational talent who blends together the best skills of Hockey Hall of Famers at warp speed. He is blessed a 6’1, 190-pound frame, great character and an awesome array of moves. I understand, why fans of 29 other NHL markets are going to hate, but I will take great pleasure in watching this wonder kids career on a nightly basis. “To be honest with you it was even better than I was expecting. 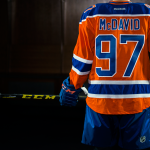 I didn’t know exactly how I was going to feel,” McDavid said. “I wasn’t too nervous, I was just anxious. They had to introduce everyone, all the teams, the roll call … it just felt like it was going by so slowly. All I wanted to do was have that pick called.” Look for McDavid to get 25-plus goals and 70-plus points if he remains healthy in his rookie season. I would’ve been ecstatic with just McDavid! But, then, the Edmonton Oilers went above and beyond. Adding, Griffin Reinhart a former fourth overall pick from 2012. Reinhart, was costly for the Oilers gave up two very high picks to get him 16th, and 33rd. Reinhart, is a 21-year-old defenseman with tremendous potential, who was behind a lot of talented people on Long Island. Reinhart, 6’4’’, 217-pound blueliner, is familiar with the city of Edmonton. He was a star, and Capt. for the Oil Kings. With Edmonton’s current situation on defense he has every opportunity to reach his potential. A top-4 shutdown defenseman. a lot of people are saying, that the price was too high. If you asked me, trading picks for more developed players like did organization did. It is what I would’ve done. 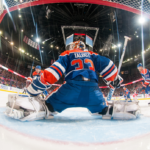 Next, the team acquired a goalie: The Oilers have traded the 57th overall, 79th overall and 184th overall to the New York Rangers in exchange for goaltender Cam Talbot and the 209th overall pick in this year’s draft. I admit, I love this kid’s potential. 21-9, this season in 36 games. Big help to the New York Rangers when “The King”, went down. Major upgrade! 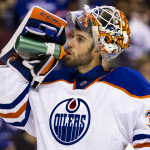 it remains to be seen however, if Talbot can be an everyday starter, behind the young inexperienced defense. The Oilers have acquired forward Brad Ross and the 107th overall pick from the Toronto Maple Leafs in exchange for defenceman Martin Marincin. 12:03 PM ET – Travis Ewanyk and the 107th overall pick were traded by the Oilers to Ottawa for defenceman Eric Gryba. 12:15 PM ET – Oilers select Caleb Jones, brother of Nashville Predators defenceman Seth Jones, 117th overall. Shortly after they select defenceman Ethan Bear. 12:48 PM ET – Oilers choose defenceman John Marino 154th overall.